A few months ago, I took a look at Monthly, a budget tracker that kept track of your expenses on a broad level. While I lauded Monthly for being a stripped-down planner, its simplicity left room for other apps to aid in expense tracking. For a more detailed experience regarding multiple budgets, there's Pennies. 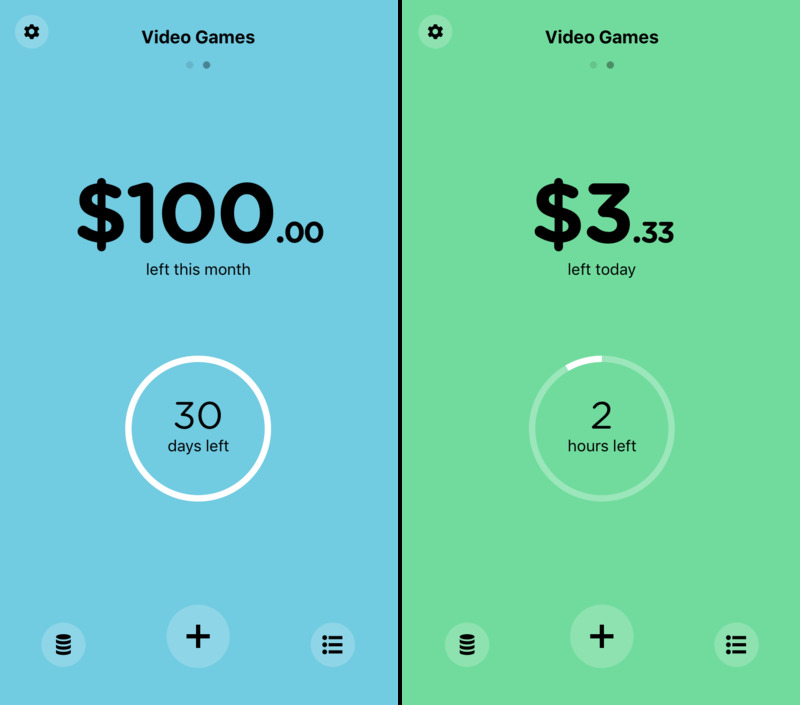 Instead of inputting every bit of money you earn and spend, Pennies is meant to keep tabs on specific spending habits, like video game purchases. Through the user setting an allowance and logging your purchases, Pennies can set you on a course toward responsible spending. With Pennies, you'll be drilling down to the specifics – where you spend your money and how frequently. 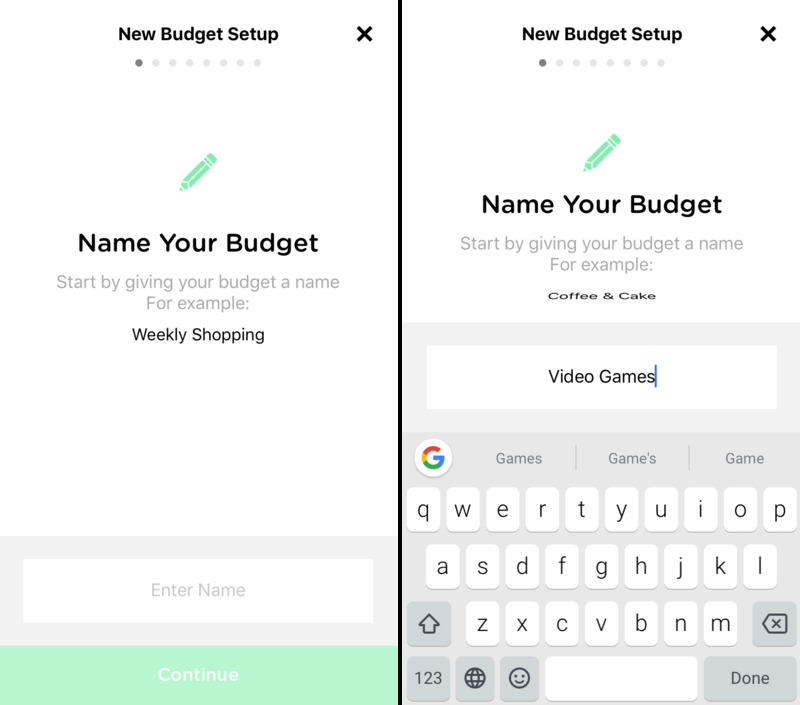 To do that, add an allowance by tapping the pennies logo at the bottom left and select "Add new budget" at the bottom of the "My Budgets" screen. Setting up a budget is a process of eight steps, all being as simple in as typing in a few characters. For example, let's say you want to spend about $100 on video games a month. 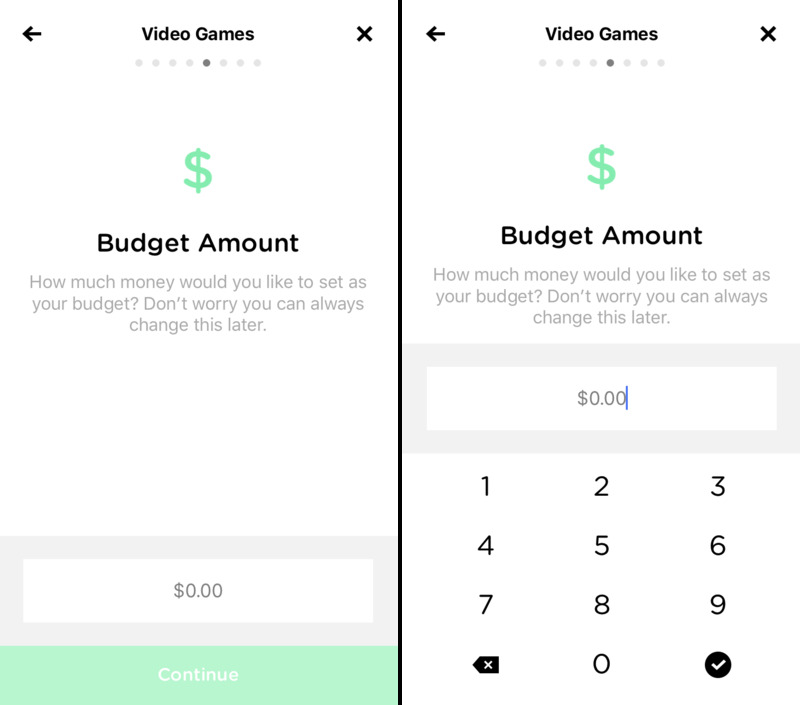 The first thing you'll do in Pennies to create your gaming budget is naming. For simplicity's sake, we'll call that "Video Games". 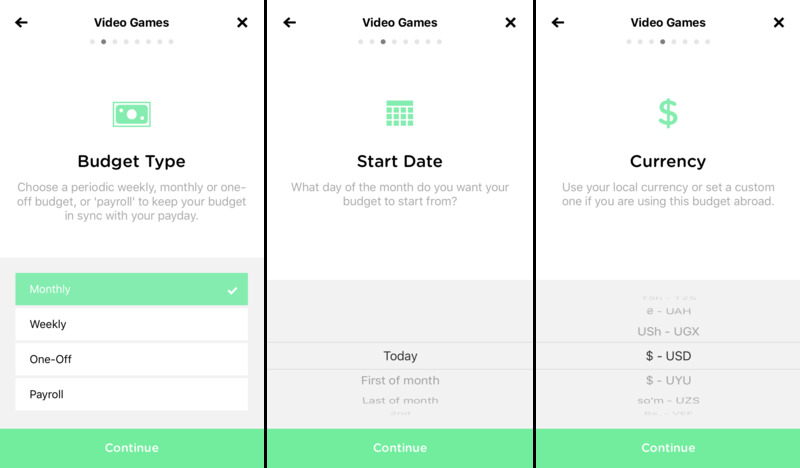 Since the $100 will occur monthly, the obvious choice in the "Budget Type" screen is monthly. However, if you change your mind at any time, you can change your budget to reset weekly, or count that specific amount as a one-off. If you're interested in inputting your payroll, that's also an option. The next step is assigning a start date. In our video game situation, we'll say that we want the budget to reset on the first of every month. For a more to-the-day refreshing of your budget, you can change the day to a specific start date, such as the fourth day of the month. Pennies offers a variety of currencies that can be determined on a budget-by-budget basis. When traveling internationally, for example, you can change your currency to match that country's. Now onto the most important part of the creation process: the budget amount. As determined earlier, we're looking to spend $100 a month on video games. In the box, we'll type that in and move on to the next part. If you're starting your budget during the middle of a cycle, you can tell Pennies how much money you have left in your budget at that current time. 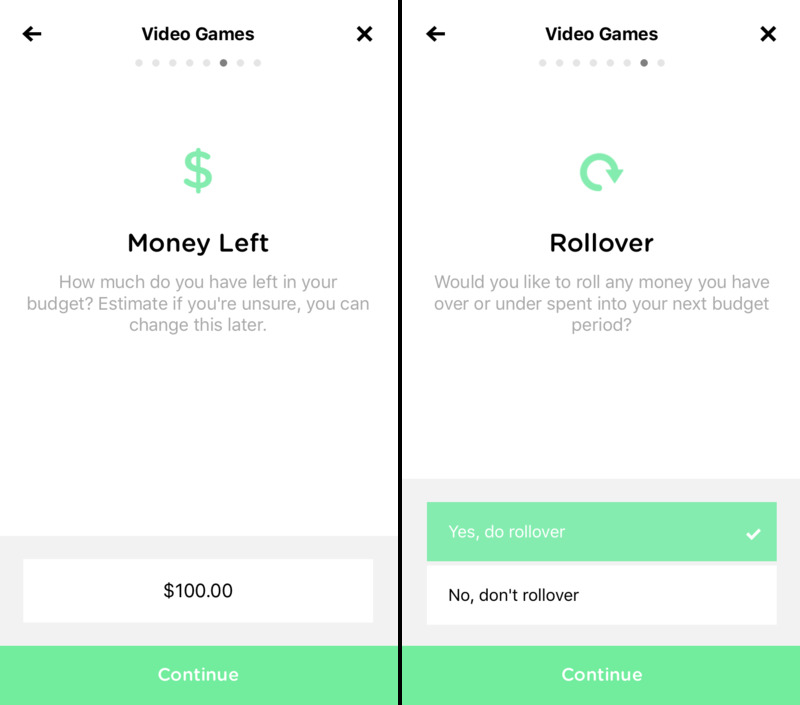 The app notifies you that you can change this later if you'd like – that's a common theme while using Pennies. Knowing the way I take care of money, we most likely won't have any money left over in our budget at the end of the month. If you're much better at managing your money than I am, you can tell Pennies to rollover your money into the next cycle. There's also an option to turn that off if you'd like to keep a tougher budget. After tapping "Finished" in the next screen, you're on your way to reviewing your budgets. Once the budget is created, the amount assigned will be displayed in big numbers at the top of the main screen. By default, you'll see the budget in the assigned timeframe – monthly or weekly. Swiping up and down on the screen will change it to a daily view, showing how much you have allotted to you that day. The circle below that amount displays how much time is left, either in days or hours. If you have Pennies tracking multiple budgets, you can view them one-at-a-time by swiping through them. Budgets that have a decent amount of the daily allotted money remaining are in green; a blue screen indicates that you've spent quite a bit of the money for the day. Red, as you might expects, means that you've gotten close or have gone over your daily limit and are on track to not make your total goal for the month. It's now time to buy a videogame, so we need to let Pennies know that we've spent that money. This can be done by tapping the plus icon at the bottom of the screen. 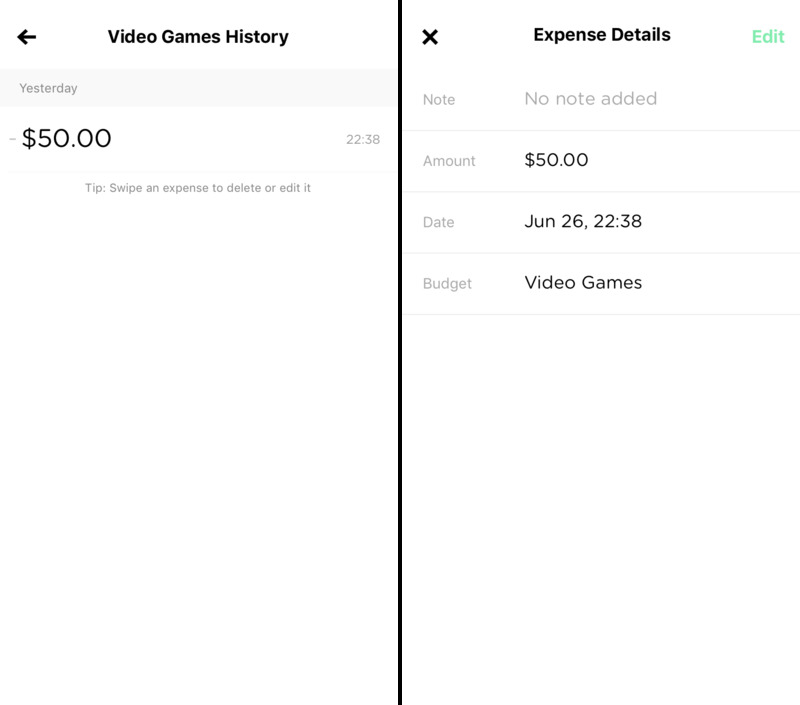 To log spent money, tap "Spend" and enter the amount you've taken out of your budget. Based on that amount, Pennies will adjust the allowance for both the current day and the total time period. The app also provides a spot to add in a quick note about the purchase, but this is optional. Alongside spending, there are additional options to transfer and receive money into or out of a budget. For extra money coming in that you'd like to add to your allowance, choose receive and add in the amount. If you'd like to move some of the currency from one budget to the next, you'll want to select "Transfer". To see all activity in Pennies, swipe left for a history of your transactions. Included is the total money spent, the optional note mentioned above, and the time the information was logged. Swiping on data will allow you to edit its time, date, and location, as well as delete it. 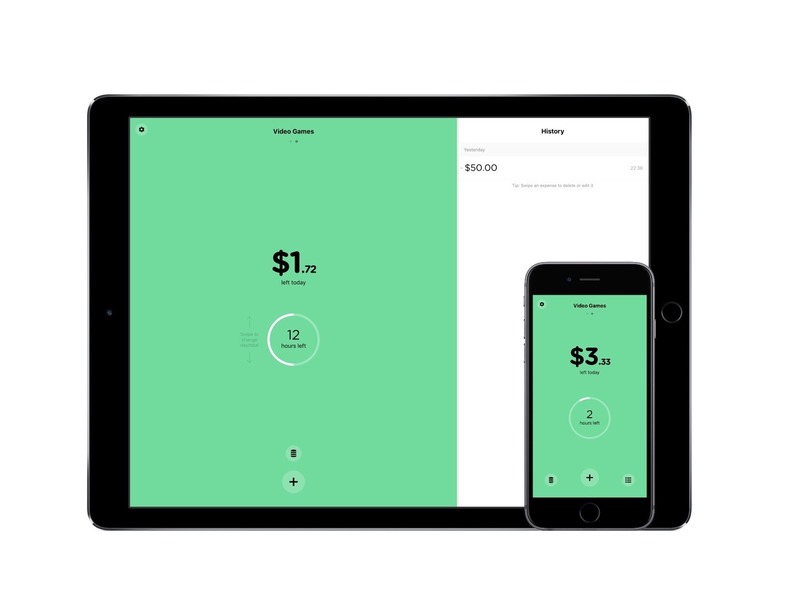 Pennies holds you accountable virtually everywhere you go by working on iPad, iPhone, and Apple Watch. On iPhone and iPad, the experience is very similar, with the iPad version's aesthetics varying because of its size (and yes, it does take full advantage of the iPad Pro). Pennies for Apple Watch offers many of the same features as its iOS counterparts in a scaled down version. By using iCloud sync, Pennies keeps your budgets updated across eligible devices. Unfortunately, with a missing Mac client, you're stuck with the iOS or watchOS apps. In case you're ever ready to leave Pennies, there's an export data setting that creates a report and presents you with the share sheet. Pennies can also set reminders for you to input information, though this option is at a set interval. Although there's no option for a tutorial, you can view information regarding Pennies's functionality in the FAQ documentation listed in settings. In future versions, it'd be great to see step-by-step tutorial to help newer users get into the app. At $4.99, it's hard for any app to justify in-app purchases; with a sound pack at $1.99, the story stays the same with Pennies. I feel like these purchases should be included in the price. Pennies is a great app that provides a ton of opportunities for you to mold it to your lifestyle as you wish. It melds beautiful design, slick animations and simple tools into a package that stands out in its category. Through its multi-year life, it has continued to receive updates that have iterated it into a great experience. If you want to give Pennies a try, you can pick it up as a universal app for $4.99 – just don't forget to add it to your app budget.